Find and compare the best prices from a range of well known car rental companies at Preveza - Lefkas Airport. This is a free to use facility, enabeling you to book direct with the company quoting the price. 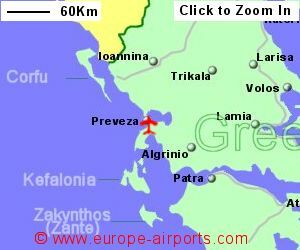 Preveza airport was built in the late 1960s and the present terminal building dates from 1988. However, since the involvement of the Fraport Group in the airport management, improvements are expected. Bus services run to Preveza and Lefkas. 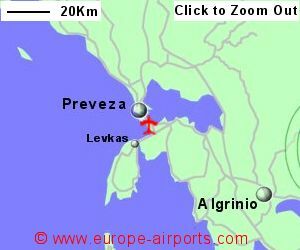 Taxi to Preveza should cost approximately 30 Euros. Facilities include 3 bars/cafes, duty free shop, an ATM, and FREE WiFi internet access. 569,000 passengers passed through Preveza Lefkas airport in 2017, an increase of 18% from the previous year.